Hi there! I stopped in to the store yesterday to return a few dresses I had ordered online and decided to try on a few of the summer dresses. I still have my rewards card to spend for this last season but have been feeling like my closet is overflowing with summer items that don’t get enough rotation, so I’ve been trying to be a bit more diligent when it comes to picking summer items. I’m now regretting not at least trying on the Tiered Eyelet Midi Dress – the SA at the store who was helping me was wearing it with a faded denim jacket and fringe sandals and it looked really cute…but she was also a few inches taller and several sizes smaller than I am. I digress. First up, the Sleeveless A-Line Dress in Windowpane Tweed. I tried this in my usual size 12 which was the right size. This silhouette is a go-to for me due to my shape and this dress was a perfect fit. It is a heavier tweed and lined, but considering most of my summer days are spent in a cool air conditioned office, I wouldn’t have an issue with the weight of this dress. The dress is a little plain on it’s own, so I would add a blazer and a statement necklace and pumps for work. I was happy with the length on the regular size (I’m 5’8″). There’s a side zipper for the dress which are always a little annoying for me – I would have preferred a (hidden) back zip. Styled creatively or layered, you could probably stretch this more than one season, but I always find I struggle with that and I think I would only tend to reach for this in the warmer months. I would consider it on sale. Next up, the Flutter-Sleeve Dress in Eyelet in white. I also tried this in a size 12. This dress also comes in bold red, which was not in my store but looks like one of J.Crew’s orangey-red colors. I wasn’t expecting to like this dress as much as I did. It was a little short for my comfort zone so I think the 12 Tall would be more in my comfort zone. I absolutely have no need for a white dress in my closet right now but it would be great if you’re a bride for a bridal shower or rehearsal dinner. I liked the small uniform eyelets and the flutter sleeve wasn’t too crazy which I liked. I don’t do a ton of orange so I may have been more likely to spring for this dress in a different color – maybe a mint or pink color. Looking at the reviews, this may have come in black as well but must have sold out fast. Next, the Flutter Sleeve Dress in Ikat. I didn’t realize this was the same style dress as the eyelet dress when I tried it on. I also tried this in a size 12. I was also surprised to see that it’s silk – it’s a very flimsy silk and I would have thought it was polyester to be honest. As you can see, the dress is pulling in the middle so definitely too small. But, as with many Crew dresses, sizing up would mean that it would be too big up top so it would have to be something that I really loved to consider altering it (or finding it on super sale!) This dress doesn’t come in a tall length, or I might have gotten a little room out of trying a tall – it’s also short but the length didn’t bother me. If you’re well endowed up top but straighter through the hip area, you’d probably be fine with your regular size in this dress – I could see it being too blousy up top if you had a smaller chest. Again, I thought the flutter sleeves were subtle and I’m not usually a big ikat fan but I liked this print. 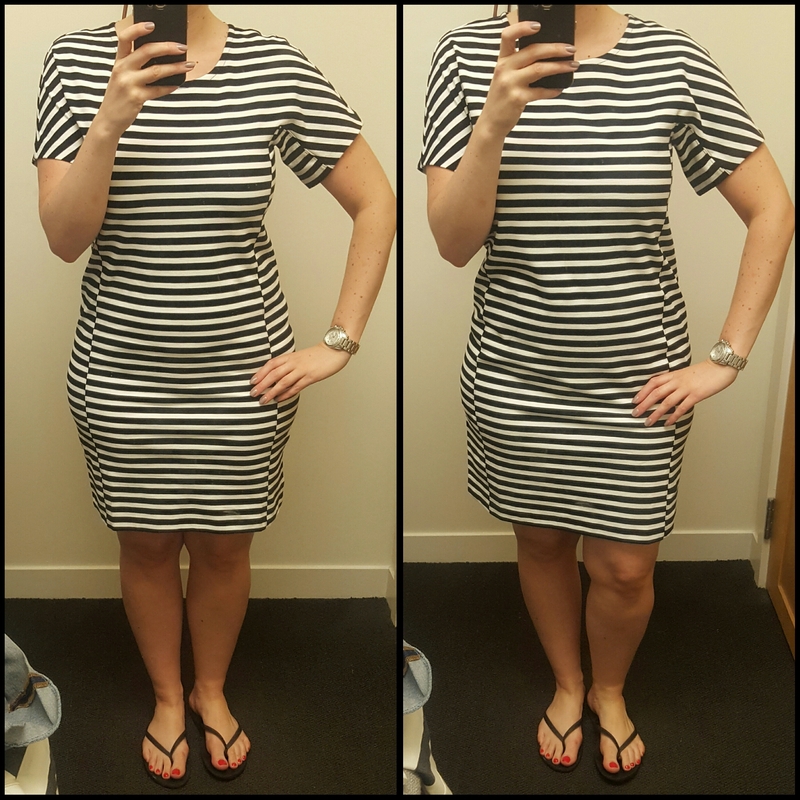 Lastly, because I need another striped dress in my life, the Striped T-Shirt Dress. I tried this in both a Medium and a Large. It also comes in a navy/fiery red combination. The medium is on the left and the large on the right. The dress has an exposed gold zipper in back which goes about halfway down the back. It’s a thicker ponte material. As you can see, the medium was a bit more form fitting and accentuated my hips with the alternating stripe design. Length wise it was about the same as the large but I personally preferred the more relaxed fit of the large. 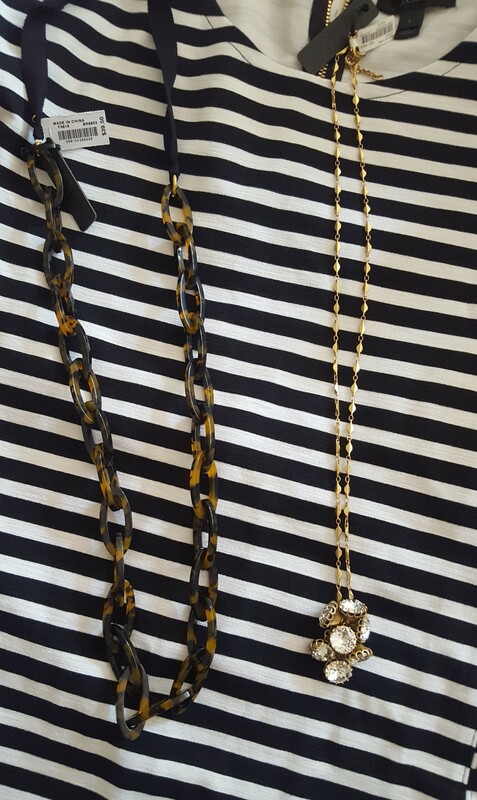 Since my rewards were burning a hole in my pocket, I decided to purchase the striped dress (I know, stripesick), and as I was checking out, a few of the necklaces caught my eye, so I picked up the Long Oval Link Necklace in Burnt Sienna as well as the Crystal Cluster Necklace. With the 30% off in store promotion, the dress and necklace came to pretty much the exact amount of my rewards (which pretty much NEVER happens). So, not much color to be seen in this post, but some nice classic summer dresses. Have you tried any of these dresses? Any favorites? Would love to hear what you think and thanks for visiting!